2008 - UIC Veteran Task Force centralized University of Illinois at Chicago (UIC) campus services and resources for military, veterans and dependents. 2009 - UIC Veterans Task Force plan adopted into Illinois State Legislation as Veterans Higher Education Services Bill/Act of 2009 (March 2009) for mandatory veterans services at all public colleges and universities. 2010 - Inaugural Welcome Home Warrior Summit, at UIC April 24, 2010 for over 4,000 military, veterans and dependents, with over 100 veteran support organizations. Nov. 2010 - Leadership team receives the Presidential Award for Volunteer Excellence for creating national model on reintegration services, for veterans and dependents at a national student veterans conference. Jan. 2011 - Collaborates with US Olympics/ Paralympic and World Sport Chicago to incorporate sporting competition for wounded, ill, and injured military, into Warrior Summit event. Aug. 2011 - Hosts the Illinois Warrior Summit and the Midwest Valor Games at Soldier Field for over 10,000 military, veterans and families connecting over 250 different veterans support organizations and businesses. Jun. 2012 - Collaborates with the U.S. and Illinois Department of Veterans Affairs, State of Illinois, City of Chicago, Chicago Park District and numerous agencies to host Inaugural Veterans Family Festival which is a veteran friendly resource fair, softball and fishing tournament for veterans and dependents. 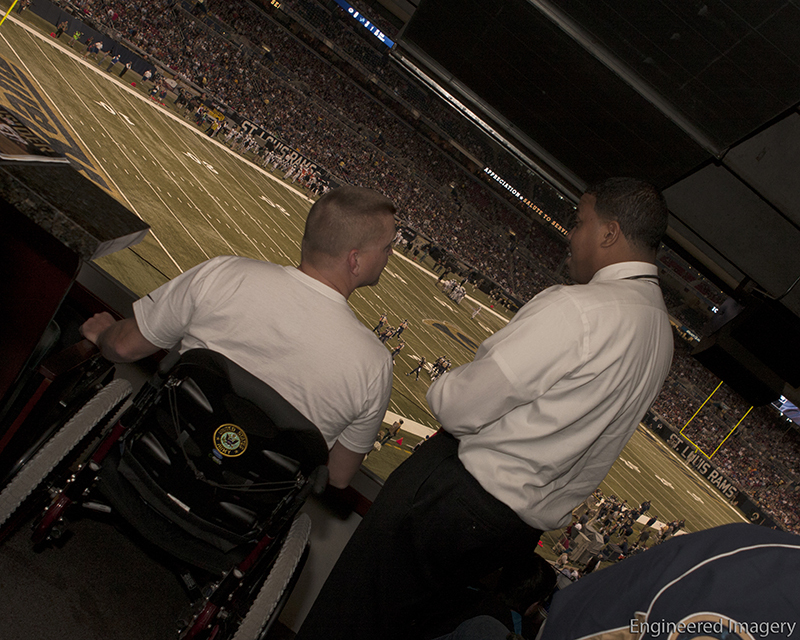 Warrior Summit Coalition President and Co-Founder James J. Flagg speaks with Soldier during a St. Louis Rams game. Sept. 2012 -WSC partners with Two Management and the St. Louis Rams to take 500 veterans to each Rams home game during the 2012 season. CEO and Co-Founder of Warrior Summit Coalition James J. Flagg and PR Director Jason Memmen receive grant from Walmart. Jul. 2015 - Walmart donates $25,000 to Warrior Summit Coalition at the 2nd Annual St Louis Welcome Home Warrior Summit. Jan. 2016 - Sept. 2016 Warrior Summit Coalition, Department of Veterans Affairs and Yendis Entertainment partner to host nine free concerts for veterans across the country. Jul. 2017 Warrior Summit Coalition, Department of Defense, Navy Wounded Warrior - Safe Harbor Program host the 2017 Warrior Games Warrior Summit in Chicago.